We are excited to be partnering with Kiwanis International to help a deserving Kiwanis club bring a playground to their community through a contest on Facebook called, Make a Difference Through Play. The winning Kiwanis club will receive $25,000 in playground equipment to be used toward a playground project that can be completed on Kiwanis One Day, April 5, 2014, which is Kiwanis International’s signature day of service. 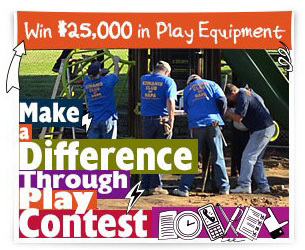 The contest is open to all Kiwanis clubs that are currently working on a playground project. Qualified contestants can enter the contest at facebook.com/Kiwanis by completing the entry form. Entries will accepted through May 5, 2013. Following the submission period, Facebook users will have the opportunity to vote for their favorite project. Find complete contest rules here. Landscape Structures became a vision partner of Kiwanis International in January 2013. Kiwanis and its family of clubs partner with Landscape Structures to bring play and playgrounds to communities across the globe. Learn more about the partnership at playlsi.com. This entry was posted in Community, Play, Playground, playgrounds and tagged Kiwanis, kiwanis clubs, Make a Difference Through Play, playground equipment, playground project, vision partner by PlayLSI. Bookmark the permalink.